Having a special family gathering or celebration? Hosting a corporate luncheon or event? No problem! With our professional catering service, we can deliver a delicious feast of authentic Puerto Rican dishes right to your door. All of our authentic Puerto Rican recipes have been passed down through generations, which means our food is rich in flavor because we incorporate traditional spices and flavorings that enhance the natural goodness of our high quality ingredients. Our Puerto Rican dishes are NEVER cooked with MSG, lard, or artificial colors or any other artificial ingredients. All of our food is made with the freshest ingredients responsibly sourced, which includes local farms. We also offer many delicious choices for those on restricted diets, including gluten free, dairy and nut free, vegetarian and vegan options. Healthy, natural, and delicious… a winning combination. Why not add a little spice to your life? Choose from a variety of tasty appetizers including our famous Empanadas enjoyed by thousands throughout southern New Hampshire and Massachusetts. We also have a many choices for main courses, including roasted meats, authentic rice dishes, as well as vegetarian, gluten free, dairy and nut free selections. Below is a just a sampling of our authentic Puerto Rican dishes, all with just the right amount of spice to tantalize any palate. To view the full menu and place your order online, please click below. Delicious, crispy fritters with a green plantain and yucca (cassava) batter, stuffed with your choice of ground beef, chicken, or beans (vegan option). 100% gluten free, dairy and nut free, without sacrificing flavor. Buttery mashed potatoes filled with ground beef with a golden, crispy crust. Scrumptious, crisp, half-moon pastry filled with your choice lightly seasoned beef and cheese, shredded chicken, or sautéed potatoes, sweet plantains and spinach (vegetarian). All fillings also include sautéed green and red peppers and are finished with a cilantro lime sauce and sofrito. 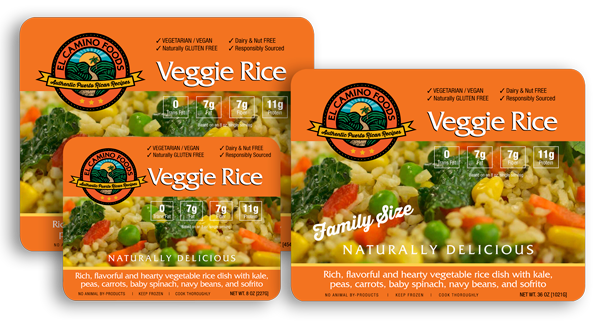 Rich, Flavorful and hearty vegetable rice dish with organic vegetables; kale, corn, green beans, peas, carrots, baby spinach, non-gmo navy beans and sofrito, cooked in a veggie stock. Hearty and flavorful rice dish with braised ham, chicken (antibiotic and hormone free) and pigeon peas, pimento and sofrito, cooked in an organic chicken stock. Pork shoulder marinated in fresh citrus juices and authentic spices, slow-roasted to perfection. Skewers of chicken, marinated in fresh citrus juices and authentic spices – grilled with our special bbq sauce. Did you enjoy the samples from our catering menu? 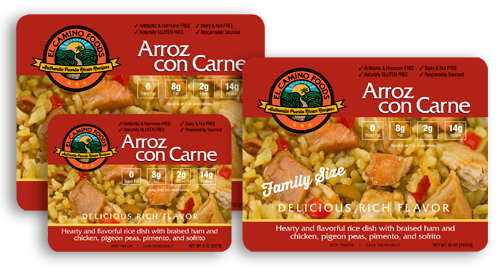 El Camino Foods enjoys participating at many local Farmers’ Markets, come visit us and try our beef and cheese, chicken, or vegetarian EMPANADAS and AUTHENTIC RICE DISHES. Please click the button to view our schedule. Can’t live without our delicious rice dishes? We understand, that is why we also offer both our VEGGIE RICE and ARROZ CON CARNE packaged and ready to go. Available in 3 sizes: Single Serving, Sharing Size, and Family Size. To learn more about our to go rice dishes, please click the link below.